There are countless wonderful reasons to love Madrid, the capital city of Spain. This is especially true as a mature student! Whilst remaining a large cosmopolitan centre and sophisticated business hub, Madrid simultaneously offers a charming, friendly and impressive backdrop for improving your Spanish. With regards to sightseeing and exploring, there are wonderful monuments, interesting plazas and extraordinary buildings with great architecture throughout the entire city. The Prado and Reina Sofia Museums, the Thyssen Gallery and the palaces of the Spanish Royal Family are the most popular. For art and culture enthusiasts, however, the choice of historic sites and beautiful landmarks is huge. For a more relaxed day you can walk through the individual neighbourhoods, see the beauty of the Retiro Park, enjoy excellent cuisine or take a Tapas tour. The unique decor of many of the local bars and cafes takes you back to the good old days. The transport system in sunny Madrid is easy to navigate, safe and efficient, allowing you to discover different parts of the city at your own pace. The school is situated in the Salamanca district, an upscale and lively area of Madrid with the city’s best shopping opportunities and a large variety of cafes and restaurants. The building is newly refurbished and has two floors with 11 classrooms in total. There is a spacious reception, a student lounge area and free internet access. On the Club 50+ course in Madrid you will receive 20 general Spanish lessons each week with a focus on practising and improving your speaking, reading, listening and writing skills. All groups will have a maximum of just 9 students per class. You can choose to attend the program for 1 or 2 weeks. 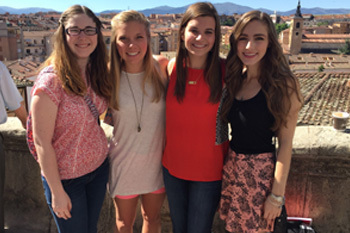 On your arrival, you will be placed in a class with other students who have a similar level of Spanish. 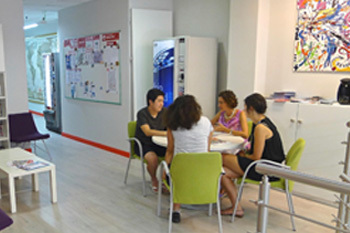 Outside of the classroom the school arranges visits, excursions and social events specially designed for mature students. They will give you the chance to relax and enjoy your free time, whilst getting to know other students of a similar age. In order to enhance your holiday and make the most of the time spent in Madrid, we offer accommodation with a Spanish host family. There is nothing quite like the fantastic opportunity that this gives you to make long-lasting friendships with the local people, to socialise and to spend your free time practising your language skills or getting to know the city from an insider’s point of view! All students arrive on a Sunday and depart on a Sunday. You have your own private bedroom and you will receive two meals per day, included in the fees. For students who wish to have total privacy, there is also accommodation available in private studio apartments in Madrid. 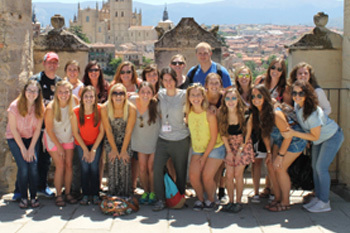 There is plenty of time outside the classroom for exploring Madrid and enjoying a relaxing holiday. In this capital city you are indeed spoilt for choice. Our Club 50+ course includes a tailor-made social and cultural program of 4 activities each week. This includes a Tapas tour, wine tastings, guided visits to the world-famous museums, flamenco shows or a traditional dinner solely for students on the Club 50+ course. Our Club 50+ course in Madrid caters for students who already have some knowledge of Spanish (Levels A2 – Elementary, to B2 – Upper Intermediate). Students with advanced levels (C1-C2) are also welcome to attend. Please contact us for further details and start dates. Madrid is the ideal location for Spanish students aged 50 years and above, as there is something for every taste and interest! Madrid Barajas International Airport is located around 16km from the city centre and from here you will receive a transfer service on your arrival, to take you directly to your accommodation. The return transfer on your departure is also included in the Club 50+ program fees. Students should arrive and depart on a Sunday.